A mainstay on the vibrant New York Jazz scene, she has performed with musical royalty such as Lou Donaldson, Frank Wess, Eric Alexander, Buster Williams, and Louis Hayes. From New York to Barcelona, Champian’s swinging style and charismatic performances have made her a guardian of the legacy of Jazz. Champian›s heroes include Bud Powell, Red Garland, Erroll Garner, Count Basie, Sarah Vaughan, and Dinah Washington. Champian is ambitious about recording her music. As a leader she has five recordings to her credit while still in her twenties. 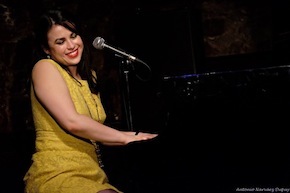 Her debut album, Champian with David Berger & the Sultans of Swing (2007 Such Sweet Thunder Records) was recorded following a two–year residency at the famed New York Jazz Club Birdland. Her following releases Sometimes I’m Happy (2008 Venus Records) and the breeze and I (2010 Gut String Records) featured her working trio. Champian Sings and Swings (2013 Sharp Nine) was acknowledged as "one of the top ten Jazz releases of the year" (NY Observer). Champian’s fifth recording, Change Partners: Live at the Yardbird Suite (2014 Cellar Live), was recorded in front of a live audience while on tour in Canada. Champian's much anticipated album, After Dark, was released in Feb 2016. After Dark features the music of Champian’s hero, Dinah Washington, and she is accompanied by Jazz luminaries David Williams on bass, Lewis Nash on drums, and Stephen Fulton on flugelhorn. Each tune was handpicked by Champian to reflect her personal favorites of Dinah›s legendary repertoire; from well known standards such as "Ain't Misbehavin" to lesser known hits such as "Keepin Out of Mischief Now", you can expect every song on the album to transport the listener and "remove the dust of everyday life," as Art Blakey would say. Champian says "[Dinah] has comforted me when I needed it, made me laugh, and warmed my heart. In recording this album of her songs, I hope to do the same for my listener. I hope this record makes you smile, feel loved, and brightens your evenings. Put it on in those quiet moments After Dark." April 2017, Champian released her latest project, "Speechless" on PosiTone Records. This recording project was something entirely new for her, because it features 9 original instrumental compositions (meaning: there's no singing on this album). 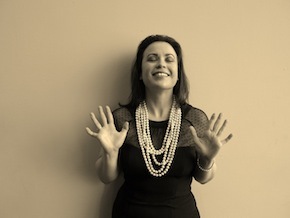 She viewed this project as an opportunity to focus on composing and her love of the piano unencumbered by singing, and the project has been received well by not only fans, but the Jazz community in general. Champian also released a Christmas Album in November 2017 called "Christmas with Champian." The Album features David Williams on bass, Fukushi Tainaka on drums and Stephen Fulton on trumpet and flugelhorn. Champian was awarded Female Jazz Vocalist of the Year in 2017 by the readers of New York’s renowned Hot House Jazz Magazine! "[Champian’s latest release, Speechless] is jazz as party music and entertainment: it’s anything but rote or slick. There’s a jubilant, fearlessly improvisational quality to these songs." "Fulton’s voice is deep and resonant, her phrasing nuanced and stylized in the way of traditional jazz singers. But her persona is modern and upbeat." "A charming young steward of the mainstream jazz tradition..."
"...the best new singer I've heard this year - make that several years." "...the most gifted pure Jazz singer of her generation." "Champian Fulton swings! She’s a fine singer and a highly skilled pianist with impeccable taste in tunes. Champian’s also a refreshingly warm and gracious stage presence. It’s been my pleasure to feature her music on Jazz a la Mode over the past 5 years, and to see her whenever she’s in the area." "As a pianist, Fulton, a dexterous, imaginative player, blends beautifully with the astute Scott Hamilton (tenor saxophone). Their shared inventiveness is evident across everything…"
-Jazz Times, reviewing "the things we did last summer"